Maybe it’s happened to you. You’re on your way to a big day on the mountain, hoping for great snow conditions, only to get stuck in traffic. And you wonder to yourself, is it just me, or is traffic getting worse here? Well, it’s not just you. According to recent analysis by the Tahoe Transportation District, approximately 24 million people visit Lake Tahoe annually, riding in 9.6 million vehicles. Those are big numbers. For some context, the entire population of Australia just hit 24 million this past February. Lake Tahoe welcomes about the same number of people per year as do the five most popular national parks combined. All those people are, for the most part, stuck in their cars. This creates ideal conditions for our epic traffic jams. No one comes to Tahoe to sit in traffic, and it’s bad news for Lake Tahoe: traffic-related pollution has become a leading cause of clarity loss. If you’re following the regional conversations, you’ve heard of all the worthy solutions we can explore: a better regional transit system; more bike trails; more sidewalks. All great ideas that will give us more convenient and enjoyable options than being doomed to sit behind the wheel in a long line of cars. But there’s one somewhat counterintuitive idea you may not yet have heard about: development projects. More specifically, redevelopment projects. By redevelopment, I mean constructing environmentally-friendly buildings on already-disturbed land in the heart of Tahoe’s existing communities. Communities across the country have benefited from experiments designed to provide people opportunities to live near where they work, or to stay while on vacation in locations near to where they will shop, go out to eat, or play outdoors. To look at an example, the Tahoe City Lodge may well serve as a model for how development should be done in the Tahoe Basin. For many other new proposed projects, a major concern of neighbors and environmental organizations like mine is how much additional traffic the new project may generate and what will be done to address it. For the Tahoe City Lodge, traffic is expected to go down. That’s right, down. How will that happen? First: location, location, location. During Tahoe’s ‘60s and ‘70s development boom, developers sought out pristine locations, often far from other desirable destinations. That pattern forces people into cars to get anywhere. By contrast, the owners of the Tahoe City Lodge are building on the site of a dilapidated old building in the middle of Tahoe City. 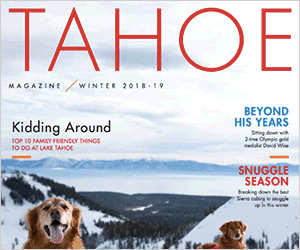 Right from the start, that means the Lodge’s guests can walk practically next door to enjoy Tahoe City’s restaurants, shops or even the shoreline of the Lake itself. This is right in line with what our regional plan calls for. But the Lodge’s developers went further. They will provide free transit passes for their staff. The building will house changing facilities for staff who commute by bicycle, high quality bicycle parking facilities and an innovative program designed to provide guests with easy access to rental bikes while visiting Tahoe. Steps like these give people real choices that make it easier to opt out of sitting in traffic and destroying the Lake. If we’re going to Keep Tahoe Blue, we need to reduce traffic using every tool in the toolbox. We need to demand that anyone planning a project in or near Lake Tahoe follow the example of the Tahoe City Lodge whose project will actually reduce traffic at the Lake. We owe it to anyone who hates traffic — that is, all of us — and we owe it to future generations, who deserve to inherit a Lake Tahoe that still inspires with its clear waters. Darcie Goodman Collins, PhD, is the executive director of the League to Save Lake Tahoe. Email her at darciecollins@keeptahoeblue.org.